I lived in Scotland for a little while, and so if there's one thing I've learned to appreciate it's whisky. And if there's two things I've learned to appreciate, it's whisky and bagpipes. Ooh, and blood sausage. Anyway. The news that a professor at Carnegie Mellon University has devised a robotic bagpipe made me perk up and take notice. Could the fantastic fellows who ply the streets of Edinburgh with their livelihood under their arms someday be eliminated by an army of gleaming automata? Ach, lad, it cannae happen! As it turns out, the McBlare (which should more properly be the "MacBlare") may not quite be up to snuff yet. 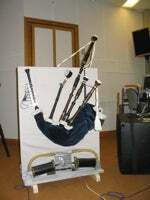 A radio show in Canada played both the McBlare and a real piper, and numerous callers insisted on giving "that weird machine" the boot. For those of you interested in the blind taste test (no peeking now! ), here are the samples. Can you tell the difference?